Toyota has reinvigorated its top selling product, the Camry, with new styling for the 2015 model year that verges on revolutionary for this once staid sedan. 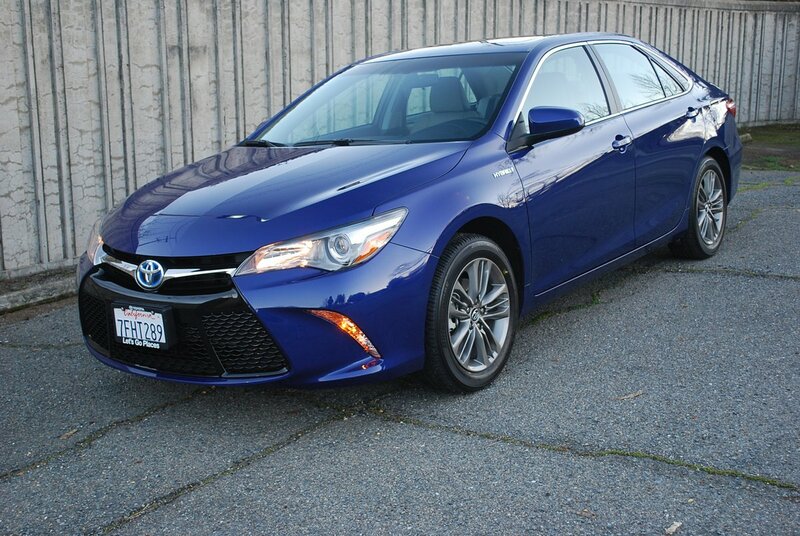 You will not confuse the bold look of the latest Camry with that of its timid predecessor. Every panel save the roof is changed for this mid-cycle makeover. Underneath the sleek new skin, however, mechanical components remain largely unchanged. At the front, a gaping black grill snorkels air into the engine room. The upper surface of the grill features a chrome strip that feeds into new projector beam headlamps with striking black sport trim bezels. On either side of the grill, indented crescent shaped amber running lights compliment the trapezoidal air opening. The Camry’s new face makes a far more successful impression than the overwrought frontal design big brother Lexus has adopted across its model line. Inside, Toyota has really jazzed up the look of the cabin to match the athletic stance of the exterior. The dashboard and door panels are trimmed out with contrasting stitching that looks more expensive than the Camry’s modest $32,133 cost would seem to justify. Similarly breaking new ground is the choice of seat fabric, an unexpectedly flamboyant looking “Sport Fabric SofTex” which would look at home decorating a Zoot Suit. Imagine the interlocking, shimmering diamond pattern produced by a kaleidoscope and you have a clear picture of the material trimming the SE Camry’s seating surface. The seats offer good long distance comfort, and the driver’s position provides 8 way power adjustment. Toyota has focused a great deal of corporate design energy on making the latest Camry gizmo friendly. For example, if you ante up $1,300 for the “EE” Navigation and App Suite Package,” the central dash stack includes a separate button labeled “APPS” for access to the extensive Entune App Suite while stationary. The navigation system plays through a 7 inch wide high resolution touch screen display that also doubles as a projector for the standard backup camera. You will never do without tunes in this EE Package Camry thanks to a 6 speaker AM/FM CD player capable of MP3/WMA playback. An auxiliary audio jack, and a USB 2.0 port with iPad connectivity augments your wide range of media selection. 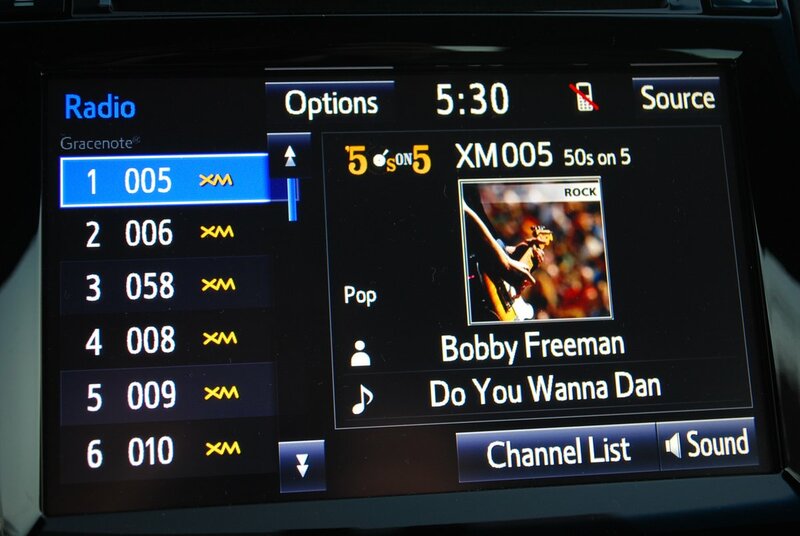 We settled on the included SiriusXM radio for entertainment, but found the tuning process rather convoluted. Toyota expends a lot of energy on the Camry’s connectivity assets, but somewhat less time on the sedan’s mechanical underpinnings. The base motor for America’s best selling mid-size sedan remains the 2.5 liter inline four (173hp). A Hybrid Synergy Drive System propels the 200hp version we tested for this report. This model is remarkable for its tremendous range of over 500 miles per tank of fuel. A solid week of driving barely lowered the predicted range to 400 miles. The Hybrid makes good, useful power thanks to the added torque of its electric motor, but what you’ll love most about this combo is the EPA combined city/highway MPG rating of 40. One notch up from the Hybrid in cost and power output is the V6 Camry SE which makes a stout 268hp and 248lb.-ft. of torque. In addition to our week with the Hybrid, we had the opportunity to sample the V6 SE for an extended drive, and found it to be fast, secure and verging on sports sedan stardom. The Hybrid, on the other hand, is more softly sprung than the V6, and makes do with rather uninspiring, hard compound tires (215/55R17 Bridgestone Turanza EL400). But the biggest difference between the Hybrid and the V6 comes in the braking department. Good short stops are never a problem with the V6, but the Hybrid’s regenerative brakes, which feed heat energy back into the Hybrid system, are never predictable enough to inspire confidence. The engagement point on the pedal varies all over the map depending on speed, terrain and pressure applied. After a couple of days with our handsome “Blue Crush Metallic” Toyota we had become rather accustomed to its revised new look. 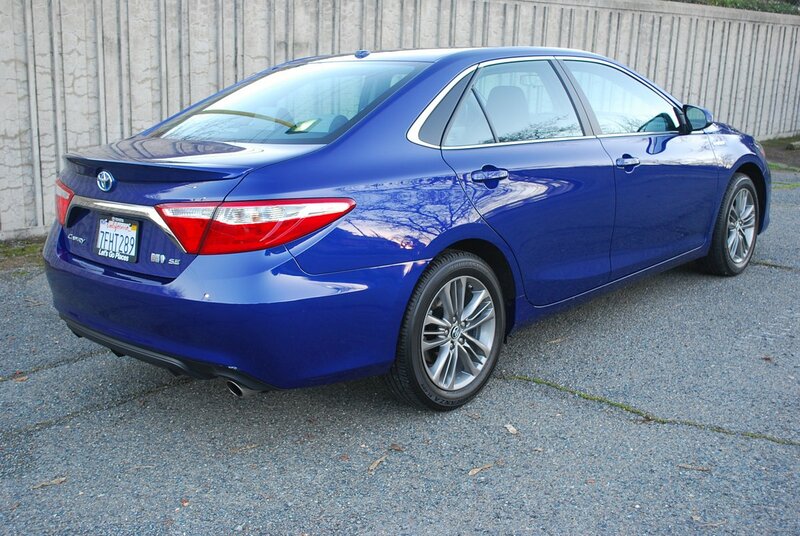 But a worker at the local Ace Hardware, who helped load some 8 foot neon tubes into the Camry’s trunk, was so taken with the interior and exterior improvements that it reopened our eyes to just how much better looking this car really is than its predecessor. Combine that upgrade with remarkable range and fuel economy, and the Hybrid SE stands taller than ever in the Mid-Size segment. Description: 2.5 liter inline 4 cylinder plus electric motor generator and self charging battery pack.